Despite the prevailing iciness on the roads, I ventured down to Boston to take in the sights at the 2015 Boston Auto Show. Once I cleared the NH/MA border on Route 3, the roads cleared up and I was able to run the Volvo up to a more respectable cruising speed. I was planning on taking the Red Line in to the city, and connecting to the Silver Line out to BCEC, but I neglected to wear a rain jacket or boots. So I ended up heading north on 95 to go south on 93, cruised effortlessly right to the convention center. Upon arriving, knowing full well that the lines would be insane, I went right to the manufacturers' test drive booths. Much to my surprise, the line for Scion was non-existent! So I put in to drive the FR-S, and was behind the wheel of an automatic (boooo), red example of the Toyobaru in short order. This was my first time driving a Toyabaru Twin, so naturally I was a bit excited to slip behind the wheel of a lightweight, rear-wheel-drive coupe. Unfortunately, given that it was a public-friendly event, Scion only brought automatic transmission equipped demonstrators. Performance: Meh. I mean, the car got out of its own way but I'm used to cars that make torque at relatively low RPMs. I didn't really tap the power of the boxer until I was on a straightaway and able to stretch the legs in 2nd gear. Needs a turbocharger. Handling: Superb! The car was tight as a drum and cornered wonderfully for a stock setup. Comfort: Seats were hard and provided support, albeit in the wrong places. The fit and finish of the interior was better than most modern Toyota products. Would I buy one: I'd have to drive a manual one to really make a call on this. It's too small to be a daily driver for me at this point, but if I had the resources for a second car, this would be a contender. As always, my goal when I attend an auto show and look at this many new cars is to ascertain which ones would make for a good daily driver at some point down the road. As a tall fat man, the challenge is finding a car that I don't have to do "the duck" to get into, where my right knee doesn't get encroached upon by a superfluously large center stack and the seat can accommodate my, uh, ample physique. As a benchmark, some of the best and most comfortable cars I've owned were any of my old Saabs (99, 900, 9000, 9-3, 9-5) and my current daily driver, the 1998 Volvo V70 XC. The Genesis has been a perennial favorite of mine at the auto show. I've watched this car grow from being a "Me Too" product into a truly world-class luxury sedan. I spent a moment sitting in the driver seat of one of the Genesises (Genesii?) on the floor, and I found the interior quality to be top-notch. However, I found that the A-pillar angle and depth of the dashboard were a bit off, so it'd probably drive me nuts as a driver. Duck Factor: Medium. Didn't have to fold myself into a pretzel to get in or out, but I had to bow my head to clear the roof. This is the successor of my current daily driver, at least in name, so I figured I'd give this a look. The first thought I had, as I opened the rear driver side door was "It's hard to think that this will be a $700 wholesale special on a lot in 16 years." After the person in the driver seat vacated the spot, I cranked the seat back and climbed in. Surprisingly, despite the fact that it's on the current S80 chassis, it felt narrower than my P80 V70. Either way, nice rig and the new digital dash is nice! Arguably a newer car than the aforementioned XC70, the S/V60 commanded my attention for a few minutes. Sadly, the newer Volvo wagons aren't nearly as cavernous as the older models. Duck Factor: High. A-pillar and roof line are much swoopier than the older ones that I'm accustomed to. I was told by opposauruswrx that I had to check out the interior in this car. It was trippy, like an Ikea-clad living room. Wasn't really appurtenant to my interests, but it was neat. You know, I was really looking forward to checking this out. Was. I found the seating position to be very awkward, which I would attribute to the high beltline. The fit and finish on the interior was atrocious, not unlike an older Chevy Aveo or something of similar origins. Not impressed at all. Duck Factor: Medium. Door opening was narrow, car-like A-pillar. Duck factor: High. Should have called this Pretzel Factor... or Pretzel Logic, because I like Steely Dan. Duck Factor: See Chevy Colorado. Not a stranger to the current generation of Chevy/GMC Full-Size pickups as a few of my friends have them, and I nearly traded my former Mini Cooper for one this past summer. Not a bad rig, but probably overkill for anything I'd be looking to do in the near future. Duck Factor: Low. This thing is the size of Rhode Island. Oh look, a Big Horn! Even after all these years, I still can't work with the level of chintziness and association I draw to the older ChryCo products that I grew up with. I bet the next generation will be nice, like the Charger. Duck Factor: More like, climb factor... which was high. I like these. I had one for a rental last year for a bit and it was everything I could have asked for in a daily driver: spacious, powerful, comfortable and good looking. When they released the 2015's new face, I was instantly in that group of people who felt it looked like a bloated Dart. However, after seeing the car in the flesh, I am a fan. I'd drive one. Duck Factor: Low. Jumped right in as if I drove one every day. I liked this truck so much, that I went and found a GIF that shows its best parts. This was the only truck I sat in at the show that I felt truly comfortable behind the wheel. 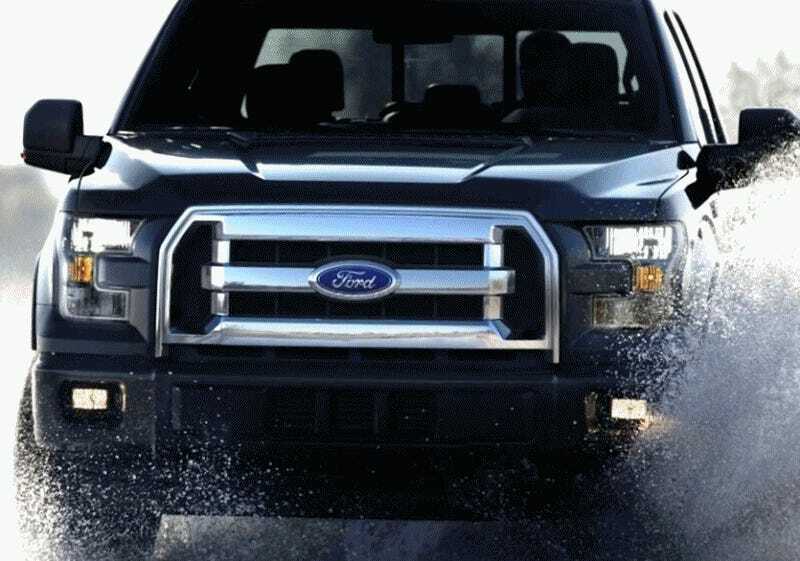 I'm not sure how I feel about an all-aluminum truck, but Ford is doing everything right as far as I'm concerned. The Tundra continues to get a resounding 'meh' from me. I'm sure it's a nice truck, but for anyone who is dropping 50-large on a truck of this size should have some seats that actually feel supportive. It was nice to sit in a Fusion that was actually well-equipped, instead of the lower-spec ones I've had for rentals on the road. They've done well. The Mustang is an uncharacteristic car for me, given my usual taste in cars. However, I think Ford has really done a good job of putting together a new iteration of their classic Pony car that attracted even the likes of me (typically attuned to European makes). My dad recently bought one of these, but I've yet to check one out. Last Taurus I drove was a new 2010, and it reminded me of a spaceship. This 2015 also was spaceship-esque, but with less of the superfluous stuff that adorned the interior of the 2010. Wouldn't mind picking one up in a few years, especially an SHO. Duck Factor: Moderate - leg encroached upon by console. After sitting in the Taurus, I figured I'd go check out its platform-mate. I liked this a lot better than the Taurus. The interior was beautifully appointed, and insanely quiet once the door was shut. Honestly, I think one of these has a good chance of being a daily driver for me in the future. Duck Factor: None. I was able to get in/out easily, without any jerking or twisting. The console was narrower than the Taurus', so my leg wasn't getting interference from the console. I've been enamored with the new MKZ since I first saw one in the flesh last year at my local car wash (owned by the local Lincoln dealer). For a gussied up Fusion, I found it to be nicely appointed and very comfortable. The A-pillar is a little too swooped back for my liking, but I could live with it. Duck Factor: Low. Narrower console than the Fusion means less encroachment on my right leg. The perennial favorite of the funeral home down the block, and platform mate of the Flex, found good favor with me. I've driven the Flex, and I found the Lincoln iteration to be a very comfortable place to sit. In terms of vehicles that could replicate the utility of my current daily driver, this is high on the list. The final vehicle I looked at this year was the newly restyled Lincoln MKX. Same qualities as the MKT, just a little shorter. I think the styling is a bit more tame on this one, but at the expense of rear cargo space. BONUS: Some crazy man was driving a mid-80s Alfa Romeo Spider towards the icy hell of New Hampshire on 93.